Go Bake or Go Home: Ultra Creamy Vegan Veggie Slaw! Ultra Creamy Vegan Veggie Slaw! As I’ve mentioned in previous posts, I like to eat salads of all kinds all the time! Even in the winter months. 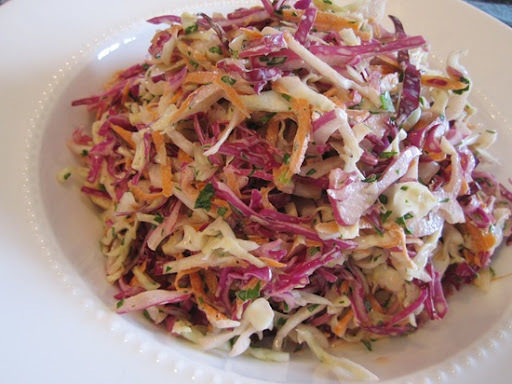 Coleslaw is traditionally a summery kind of salad, usually enjoyed at picnics and potlucks. But I don’t really care about that! I generally use a very sharp chef’s knife to finely slice the cabbage in long, thin strands but you can use the shredder/grating blade or the metal "S" blade on the food processor if you prefer a finer slaw texture, a little more reminiscent of traditional deli-counter style creamy slaws. This slaw is super creamy, saucy and satisfying. 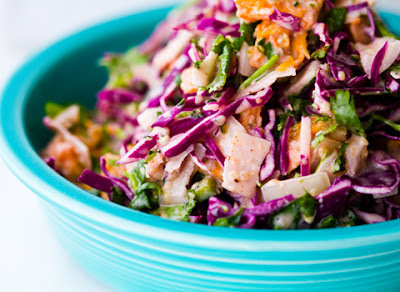 I love the flavor that the Bubbies relish lends to this cabbage salad. 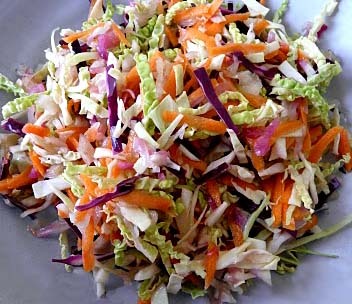 The slaw will keep for up to 2 days in the refrigerator but is best consumed on the same day that it’s prepared. After that, the milk and mayo will begin to curdle and change texture because of the acid in the dressing. Also, the larger the cabbage pieces, the crunchier the slaw! In a large bowl, stir in the veggies. In a separate smaller bowl, stir the Vegenaise, Bubbies, non-dairy milk, vinegar, sugar and salt and pepper. A fun variation would be to substitute a little tahini or cashew butter for some of the mayo! A little healthier but still super rich and creamy!